Should I Replace My Air Conditioning System Before Next Summer? Now is right about the time where everyone starts to think about what to do to get their homes ready for the fall and winter seasons. If you’re one of those people, not so fast! You may still have some decisions to make regarding your air conditioning system before the summer comes to an end. Namely: should you replace your air conditioning system now instead of waiting? Read on to find out more about why it might be a good idea to get yourself a new air conditioner before worrying about getting ready for heating season. Do You Need a New Air Conditioner at All? Is your air conditioner costing a lot to use from month to month? If so, you may need a new one. As an air conditioner ages, it will lose efficiency due to years of wear and tear. The more the efficiency of the system drops, the longer it will have to operate in order to keep a home cool. This adds to the monthly cost of using the system. Is your air conditioner breaking down frequently? Breaking down once every few years or so is not a big deal. Breaking down every year, or multiple times a year, is not a good sign at all. That often indicates that the air conditioner is on its last proverbial legs. You should call a technician to examine it as soon as possible. Is your air conditioner older than 15? 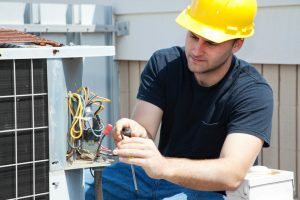 Air conditioner systems often don’t get much beyond that age before they start to accumulate all kinds of chronic problems that prevent them from operating in a cost-efficient way. If your air conditioner is that old, you should probably replace it. So if you do need a new air conditioning system, why would you bother installing one now instead of next year when it’s closer to summer? Because if you do it right now, you garner a number of benefits. Prices on air conditioners are likely to be slightly lower in the off-season, so it’s better to install one now and save yourself some money. Installing one now instead of waiting until right before summer starts also means that you’re not competing with everyone else who is trying to have air conditioning systems installed. If you need a new air conditioner installed in your home, contact us today to schedule an appointment. We’ll make sure that you find the perfect air conditioning system for your needs. Sunset Air offers comprehensive Tacoma, WA HVAC services. © 2013–2019 Sunset Air. All rights reserved.